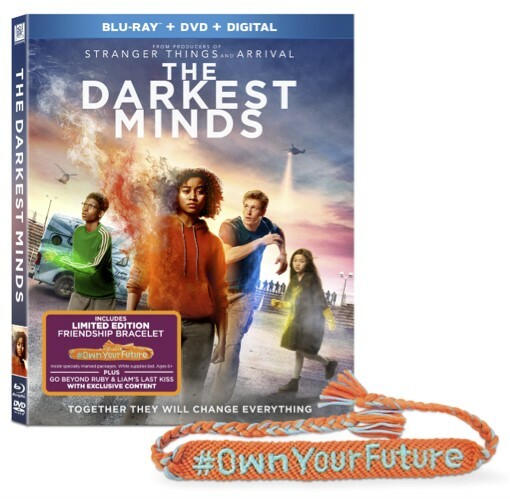 We watched The Darkest Minds last weekend and have seen it three times since. I think for a mix of teen romance, science fiction, action and a touch of drama it was a really good movie. Kids who like Maze Runner, The Hunger Games, Harry Potter and even the campy Sky High will enjoy this movie. 98% of the children are dying. If you don't die you have super powers. Those who didn't die are quickly rounded up and shipped out to concentration camps. Sounds like a good premise right? It is. Ruby is broken out by MANDY MOORE (Yes, that Mandy) but she doesn't trust any adults and it seems like Mandy has an agenda of her own. Ruby and some other kids escape and find out there is way more to this "disease" than meets the eye. I thoroughly enjoyed watching this movie with my kids and thought the scene where her mommy doesn't recognize her was so sad. There was a lot of armed adults with guns pointed at kids which didn't concern my kids but I wanted to mention. This is a great movie for kids over 13. Mostly because there is flirting and those guns and a few curses. Nothing that was embarrassing to see with my kids but my 13 year old daughter did mention that it was weird to hear them in a "kid" movie. We haven't watched the extra yet but hope to do so soon. I had no idea that this movie was based on a book series called The Darkest Minds by Alexandra Bracken which I hope to check out.